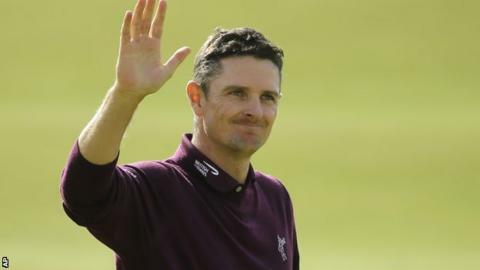 England's top golfer Justin Rose will start the final day of The Open in contention - but says he is happy to have become the 'invisible' man. The world-ranked number eight is three shots off the lead at St Andrews on nine-under par after a second successive four-under 68. Fellow Englishmen David Howell and Luke Donald fell away with 73s and Paul Casey shot 75. "I'm kind of invisible, which I like," the 2013 US Open winner told BBC Sport. "I finally birdied 18 for the first time this week. And, after making tough six-foot putts for par at 16 and 17, to bury both of those and make that putt at the last too gives me a lot of confidence going into tomorrow. In 18 years as a professional, Rose is still looking to match his best-ever Open finish - he tied for fourth at Royal Birkdale in 1998 when, in his last round of golf as a 17-year-old Hampshire amateur, he chipped in at the last. He played the first two days with former St Andrews Open champion Sir Nick Faldo, who had special praise for him when he finished on Friday evening: "Rosey's playing nicely. He's always threatening the hole. Now it's pressure time, trying to win The Open." "My caddie said to me on 16 'It's going to take three solid rounds and a low one - and we haven't had a low one yet.' It's probably going to have to take a 63. But I'm playing well and I'm putting well." On top of the poor weather in Fife this week, Rose has suffered badly with hay fever, but even that problem was eradicated by Sunday's change of wind direction. "I've figured it out," he said. "When we get a westerly wind coming in off the fields I struggle and when we get the easterly breeze, I'm much better." Justin Rose has been paired with South African Retief Goosen, the twice former US Open champion, for Monday's final round. They are scheduled to tee off at 13:50 BST. Now, backed by the experience of knowing what it takes to win a major, he is looking for a similar sea change at the very top of the leaderboard. "It really felt like the Open came alive today," he added. "It's been a little flat and has been tough for the spectators. "We've had it all this week and it was four seasons in a day today. But it was glorious out there coming down 18. Almost ice cream weather and suddenly it really feels like an Open."